The Arboretum's boxwood collection is acknowledged by members of the American Boxwood Society as one of the most important in the United States and a member of the National Boxwood Trials. 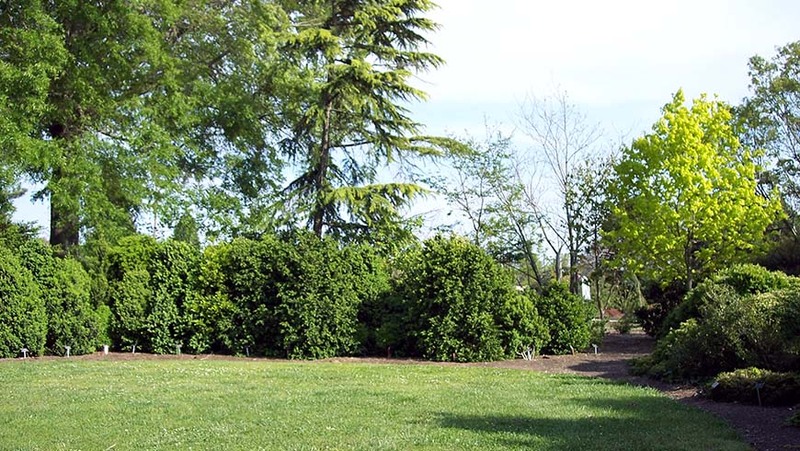 These trials, with member institutions in the eastern United States, England, China, Republic of Georgia, and Ukraine, compare the various cultivars and species of Buxus for garden merit. One of the very earliest of ornamental plants to be introduced to North America from Europe in the mid 1600s, boxwoods have long been valued as elegant and formal evergreen shrubs for framing areas of the garden, and as individual specimens, foundation plants, topiary, and bonsai. They vary widely in shape, size, growth rate, and cold hardiness. Boxwoods are commonly grown in full sun, but they also do quite well in dry, shady conditions. The Boxwood Collection is a popular area for outdoor parties and other events. For details, please visit our Rentals section. Additional photographs of the Boxwood Collection can be found in our Photograph Collection.